Marelen would be a brilliant place for small children. Apart from the kiddies pool,a small water park was built there a few years ago. From what I remember there are slides there etc and I'm sure it would appeal to the younger ones. For adults there is a normal sized pool as well as a jacuzzi. Looking at booking a family holiday in late may. Looking for relaxing but not too quiet for children (2 and 4) Really like the marelen hotel. Anybody know if this is a good choice? Can someoune help me ,do they have big supermarkets in Zante Kalimaki or surrounding town .i mean supermarkets like wall mart ? stayed at carreta beach apartments that are no where near a beach they have a free bus that takes you there but you wait ages for them to come. hotel isnt very friendly even though wee were scottish so is the manager didnt say a thing to us. beds in hotel were trrrible near had a good nights sleep at all. kalamaki quite most shops sell same things can get a taxi to zante town 9� nmore shops. we went sept expect rain although they say oct nice a lot shuts down a lot shut when wee were there. Hi Jo, 100% recommend garden village, truly amazing place. But will depend if you want this year or next, could be booked up this year but just read of their review that someone got a late booking so you could be lucky. If you want to go next year book early......its with Thomson next year. ideal place for a relaxing break, the beach is lovely and quite warm, safe for the kids you can walk quitw far out and still be at your knees the turtles are lovely to watch, hire a pedalo, don't bother paying trip prices, you will see just as many popping their heads up for a breather. Theres plenty of places to eat, a handful of shops and a couple of bars. I have just got back from a weeks stay in Kalamaki and I had a great time. I would say the resort is great for most people except from those who want to go clubbing all the time. It has a fantastic beach and you can walk to Laganas along the beach. The sea is very nice and clean. The resort has a wide choice of restuarants, bars and shops and also has a couple of clubs. I went to the fire club and found it ok. I would recommend visiting Tazies for snacks in the day time or after a night of drinking. It is great there and they do food for everyones taste. Cronulla Hotel snack bar is good for food as well and also evening drinks. They welcome everyone including families and open until 2:00am. They have Karaoke's on a regular basis, internet access, pool table and other games machines. The cocktails are also great. Overall Kalamaki is a great all round resort and only 10 minutes from the airport. Yes there is a lot of planes flying over but that is only in the day time as there is no night flights allowed. After a day you get use to it and dont take any notice! Kalamaki was lovely � lots of restaurants, supermarkets and shops but still quiet and peaceful. Lovely long sandy beach. Would definitely recommend this resort if you're not into clubbing. We bought some cheap lilos and used them instead of paying for sun beds each day. We found September was a good month to visit as not too hot. All in all I would definitely recommend Zante � apparently one of the greenest Greek islands too. We had a lovely relaxing time and found majority of people very welcoming. Kalamaki to me is the best resort on Zakynthos, it has a lovely clean beach and there are plenty of choices of restaurants and bars. Everyone is very friendly. It is not too noisy or busy, a great place for a relaxing holiday. Kalamaki is a fantastic place and I will be returning again in June. Two wonderfull weeks among lovely people, brilliant beaches, FANTASTIC food. what more could you ask for? We WILL be back next year . Well...We have been comming to Kalamaki for 11 or 12 years now...Says it all really!! Kalamaki is a wonderful Resort which is a must for families and couples. It provides a good selection of Tavernas and Bars, as well as the sea with its crystal clear water! Kalamaki is a resort where there is always something going on, but you can also relax and chill! You will not be disapointed here! I have just returned from kalamaki for the ninth time and me and my family love it there. The beaches are great, the weather is great and the people are great. I love going here every year. I highly recommend the resturant the Olive Tree. My wife, daughter and myself have just returned from our third visit to Zante and second to the resort of Kalamaki, staying at the Hotel Marelen. I would agree that Kalamaki is a fantastic resort at which to stay with sufficient bars, restaurants, supermarkets etc. to ensure that if you did not want to leave the resort during your stay there is no need to do so. The Hotel Marelen was clean and well maintained with very friendly, helpful staff. Our personal best choice of all of the restaurants were Paulo's, Buon Amici and Zepo's and I would recommend any of them without a doubt for excellent, value for money food. All in all a fantastic fortnight was had by all, with superb weather only adding to the experience. We would recommend a trip to the resort without any hesitation. Have just got back from my fourth year running to Kalamaki. The atmosphere in this resort is so nice and the Greek people are so genuinely friendly and interested in finding out more about you. Can highly recomend The Roof Garden (next to the Cava Dora apartments) for excellent food and they are really lovely people. P & P's is a chilled out bar serving cocktails and coffees, and Labros and Angelo are really lovely guys. Had some interesting conversations with the owner of Sugar Reef, (which also serves lovely food) Ellis (the guy selling trips at the T junction) is so sweet - even when he knows you aren't going to book a trip he still wants to to talk to you. He knows his geography and is always asking about where you come from. I hope that Kalamaki stays exactly as it is and retains its charm and warmth, as the locals here are such lovely people who will go out of their way to make your stay as pleasurable as possible. Will definately be back next year.....if not sooner! just got back from my fifth visit to kalamaki it is a brilliant place, people very friendly, weather great, good shops and bars,aircraft noise not a problem, go and enjoy. 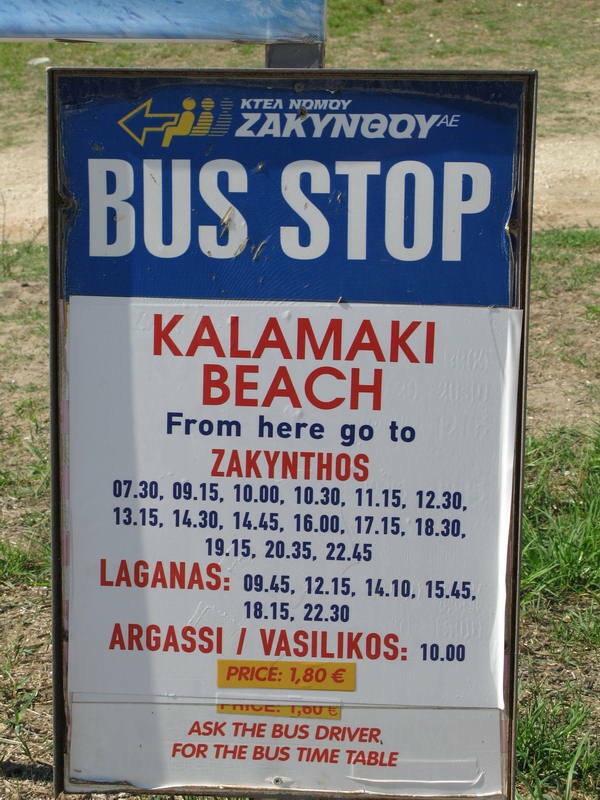 This List is an updated version by Chris C for 2007 of those posted over the years and are his personal tips for visitors to Kalamaki! If you feel something should be added or changed, let me know! I`d advise anyone to check with their airline and Departure Airport as to what you can take currently, as it seems to vary from airport to airport, well in advance of going on your holiday, there are drastic changes so please check carefully! Yes, DEPARTURES is small, but it is in the process of being rebuilt eventually and remember it is a tiny fraction of your holiday! The new ARRIVALS LOUNGE is open and running. On your return journey, take water,hat and sunblock in high season as you do have to queue outside to avoid crowding inside. Avoid the FOOD KIOSKS, they are extortionate and the food not good! The Duty Free shop up the stairs has a fridge at the back selling cold beer and pop at normal prices, buy from there. Please be courteous, allow people with kids, older people or ladies to have your seat! Regarding AIRPORT NOISE in the hotels, I have never been disturbed by it, in fact it`s enjoyable watching the planes coming in and out! 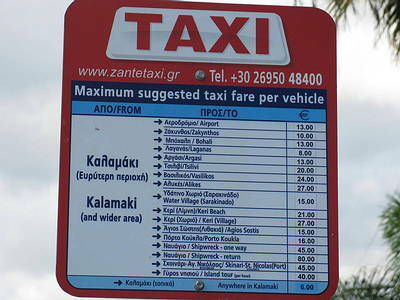 A taxi costs very little to any of the resorts if you haven`t a transfer or don`t want to wait for the bus. I normally advise to book tours locally rather than the reps as they are cheaper by far, HOWEVER some cut price tours locally have been poor quality and so it may be best to book these via your rep, especially if it is a trip with any risk eg 4x4 tours, watersports etc, as there may be problems on insurance if you use a local company. I would NOT recommend a full day boat trip, the potential to burn and be seasick is very high! If you do wish to take part in one please take loads of sunblock. Apparently some do not allow you to take your own food and drink on them so check first. I use Hermes (next to Mermaids,ask for Yiannis) or Merlis (see Julie who is very helpful), and always check the small print! Always get the DAMAGE WAIVER and check it covers everything including underside damage (there are a lot of pot holes!!). I would never, ever recommend tourists hiring mopeds or Quads .I would advise anyone to hire a 4x4 and drive wherever you feel like it, it is a small island and you will find breathtaking views, traditional shops and tavernas and beautiful beaches, it is a fantastic experience to get out of the resort and do this! The Horse and Cart rides are, to be honest, very expensive. Don`t drink the WATER, it has a very high mineral content, and I don`t even brush my teeth with it. Mineral water is very cheap, stock up from the shops. I avoid ice in drinks, and anything like fruit salad etc that is prepackaged. The best MOSQUITO KILLER I have found is the Boots own brand Liquid plug in, very effective and essential. Please avoid HENNA TATTOOS, people have been poisoned and in some cases permanently burned by the ink. Make sure you have TRAVEL INSURANCE and also the new E111 CARD, you can apply for the E111 and it is free, at your Post Office. You don`t need any particular vaccinations to travel to Greece. In the main summer months it is well worth paying for the airconditioning to cool your rooms. The beauty of Kalamaki is there is a bar and restaurant for everyone`s tastes. Everyone has their own favourites, and you will see the better restaurants as they are busy, people go back for quality and service.You can choose quiet places in secluded spots, a light snack or a takeaway if you wish anywhere in the resort. Everyone has different tastes though, so I always think it better if people DON`T ask for people`s recommendations on various Kalamaki forums, they may well have different tastes to yours....go where you think you like the look of the restaurant, try different ones, and see which are busy as people tend to go back for good food and service! There is a cover charge of about 80 cents in most restaurants, it includes bread. Please IGNORE some of the reviews on websites and try places for yourselves. If you have a problem with your hotel, meal, drinks or whatever please ASK TO SEE THE MANAGER, Greek people want you to enjoy your holiday and will do their utmost to solve any problems.Also the odd review that says Kalamaki is tacky, these people obviously didn`t get out and about and try different places! If you have good service, please tip well! To Greeks you are seen as a guest to be welcomed, if you offer friendliness back (or the courtesy of a tip) you will be remembered in years to come, I have never met friendlier people in my life, and can count many from Kalamaki as true friends. Remember you are 2 hours ahead and in summer very few eat out before 8pm, the reason being it`s just too hot!!!! You can use any pool bar you wish, but please buy your drinks from the bar whose pool you are using. Also there will be a crackdown next year on towels being deposited to save sunloungers when people then go off for the day, as happens a lot! Another tip, buy a LI-LO, you can use it if no sunbeds are available and when you go to the beach use it to lie on rather than pay 7 euros a day for a sunlounger!!!! I also buy beach towels in resort for about 4 euros, it saves a lot of suitcase weight if you`re going for 2 weeks and may be over limit! The rate is always higher in Greece, on a �600 budget per person for a fortnight you will save up to �30 by changing your money in resort rather than in England! I take Sterling in cash and change as required. There is an ATM Machine outside Limnos Supermarket. I think �600 per person per fortnight is more than enough and that includes all meals and drinks out! Cigarette prices are set by the government, Embassy No1 were 28 euros (about �20) in September 2005, you are allowed 3200 (16 boxes) to take home. Spirits etc are also 30% cheaper than the UK. I buy my duty free from LIMNOS (near Mermaids) or SOFIA`S stores, they also tend to give the best exchange rates. You can also buy duty free on the airport. Remember you cannot buy spirits and tobacco on the plane!Get aftershaves on the airport, don`t waste money on fake rubbish in the shops!Zante Town is good for a shopping trip with some excellent jewellery and clothes if you hunt around, just remember they close for siesta! I have to include a bit about the resort of Laganas which was a major news item in the press in 2005 and 2006 and had a huge detriment to the island due to irresponsible reporting, and not making any distinctions between one resort and the whole island. Basically the tour operators shifted the organised `booze holidays` from Faliraki to Laganas in 2005. In 2006 it continued but on a lesser level as Cancun and others became the next `recipients` of this. Basically it is a Party Resort which like in many UK towns involves heavy drinking, loud music, big groups of lads and lasses and basically at night is a British Town with sun. If you wouldn`t go into a town centre here at night or take your kids, then don`t go. If you want something a bit more wild then give it a try.Laganas is NOT Zakynthos,it is not Kalamaki or Argassi or Alykes, it is just one small resort, and the irresponsible press must share some blame for fuelling the hysteria over this.Let`s not make any bones about it, the people to blame for this are the press who by reporting the sordid details encouraged certain types to go, the tour ops and above all the people who behave in these ways. News has filtered through in the last 12 months of the Police now taking a hard stance on improper behaviour and also that organised Bar Crawls in Laganas may have been banned, long may this continue! There is the very occasional problem with crime, but far less than in the UK, but simply behave as you would in the UK ie lock your windows and doors on leaving your rooms, be watchful on unlit paths late ant night etc. The Rose Sellers are a nuisance, keep an eye on valuables when they are around. If someone phones or texts you you do pay part of the call, my advice is to use the payphones at SOFIA`S or LIMNOS shop, never use the hotel ones. If you are taking your mobile, ask people not to ring you unless essential, they can be quite sure you are having a great time! For big users, there are three options also to using your normal sim. Tour ops have been a bit strict on this in 2006, check your allowance as some late deals cut the amount you can take.Leave any half used shampoos, shave foams etc for your maids in the rooms when leaving, they will be very appreciative, and you free up valuable baggage space.200 Cigs saves you �30 on UK price, a half bottle of shampoo is worth a quid for the same weight as the cigs! If you are over expect to pay about �4/kg. This is a very nasty trick pulled if you have a night flight and arrive at say 9am at your hotel, that counts as your first night. If you have a late flight back on departure, pay NO MORE than 30 euros for the room for the extra night, and if it is to just shower and store your luggage why not pool the cost with friends you`ve made on holiday!